The Pentagon’s 1033 Program, which is militarizing state and local police forces with everything from high-powered firearms to armored vehicles, is also giving weapons to officials who have no law enforcement functions. The practice is leading watchdogs and even some US government officials to question why the US military is so desperate to unload its cache of used military hardware that it is even willing to arm a local coroner, and other state and local officials who have no apparent need for firepower. Doug Wortham is the coroner in Sharp County, Arkansas, whose working day consists of dealing with dead people. Nevertheless, he used the Defense Department’s 1033 program to acquire an assault rifle, a handgun and a Humvee. It was also reported that the coroner’s office acquired items through the program but forfeited its rights last year following revelations about some of its procurements, including a kayak. “Why would a coroner's office need a kayak?” asked Tina Owens, deputy director of the Arkansas Department of Emergency Management, as cited by AP. Civic watchdog groups have been sounding the alarm over the militarization of local and state law enforcement agencies for years. However, the August shooting death of black teenager Michael Brown in Ferguson, Missouri, followed by violent protests that pitted hundreds of protesters against heavily armed police clad in military gear, attracted public attention to the issue. In August, the White House ordered a review of the 1033 Program, which mostly delivered excess weapons and tactical equipment to local police departments. Here are some of the agencies that received weapons and military gear through the program: The harbormaster in Dartmouth, Massachusetts, received a Humvee for negotiating tough terrain and “a night-vision scope to spot boaters in the dark;” the Arkansas Tobacco Control agency acquired five 12-gauge shotguns for its agents, “who help regulate tobacco retailers and wholesalers;” the Wyoming Livestock Board, which provides Glocks and .45-caliber handguns to its officers “who investigate cattle thefts and other industry-related crimes;” the Mississippi Department of Transportation got seven M-14 rifles through the program, AP reported. Any investigation into the weapons giveaway, however, will be hampered by the program’s cloak of secrecy that only reveals information on the county level regarding the transfers. Meanwhile, battlefield-grade equipment accounted for “a fraction” of the used items available, with some agencies participating in the program to receive office equipment and other such goods, AP said. It was only through information voluntarily provided to AP that it was able to discover the destination of the inventories. Meanwhile, it was earlier revealed that at least 26 school districts have participated in the Pentagon’s weapons program, which since the 1990s has provided free military surplus goods, including mine-resistant armored vehicles, grenade launchers and M16 rifles. 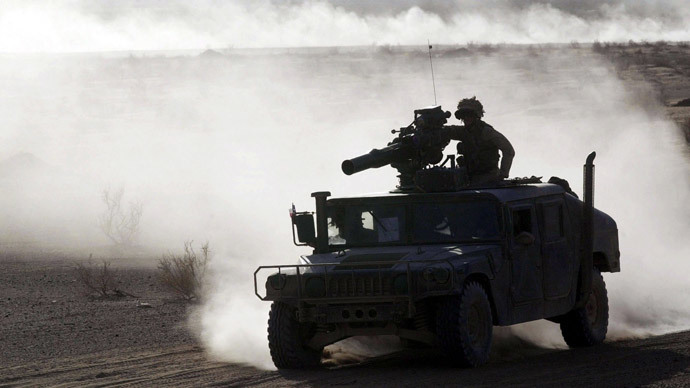 Last month, the San Diego Unified School District Police Department (SDUSD) announced that it had received from the federal government a $733,000 Mine-Resistant Ambush Protected (MRAP) vehicle similar to the models used in the Iraq and Afghanistan wars. Although the 18-ton vehicle does not come with any weapons, watchdog groups are wondering exactly what type of school emergency would require the use of an armored military vehicle. 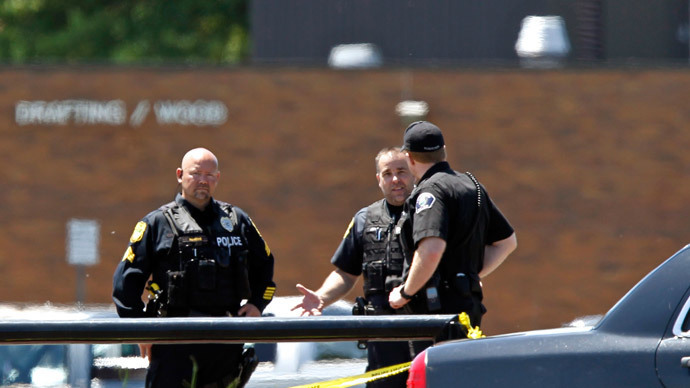 The ongoing militarization of school police departments has been explained by incidences of violence on school grounds, most notably the 1999 Columbine High School massacre, which left 15 dead, including the two perpetrators of the shooting spree. In September, almost two dozen educational and civil rights groups sent a letter to Pentagon officials, urging them to stop militarizing US school police departments, which have been reported in California, Texas, Nevada, Utah, Florida, Georgia, Kansas and Michigan. “Adding the presence of military-grade weapons to school climates that have become increasingly hostile due to their over-reliance on police to handle routine student discipline can only exacerbate existing tensions,” said the protest letter, signed by a number of groups, including the NAACP’s Legal Defense and Education Fund, the Children’s Law Center and Public Counsel. President Barack Obama in August ordered a review of federal programs that allow state and local law enforcement to acquire military-grade weapons and equipment.